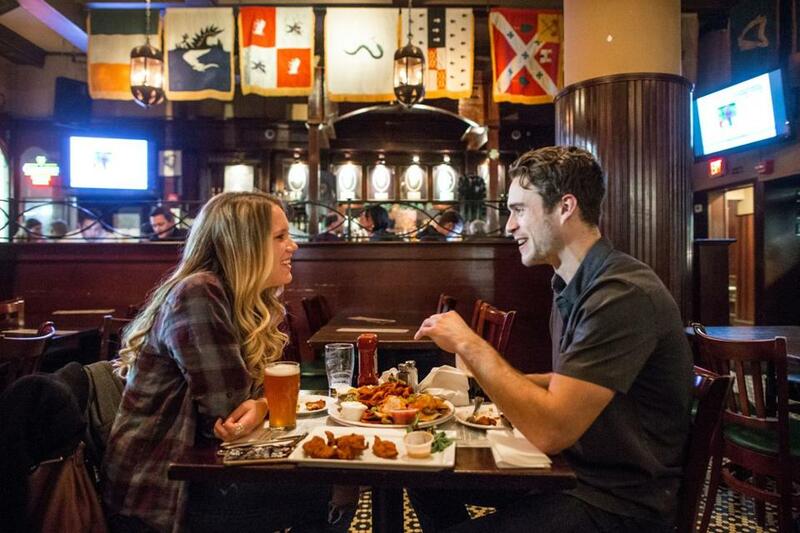 Brianna Grima and Will Carey dine against the backdrop of colorful flags. The Black Rose, famous for its live music, Irish coffee, and pleasantly poured pints of Guinness, is celebrating a big anniversary — number 40 — this spring. For decades the popular pub has been a cornerstone of Faneuil Hall nightlife, providing live entertainment seven days a week — a tradition that began in 1976 and will continue today, St. Patrick’s Day, when doors open at 8 a.m. for festivities that will last until the wee hours. Music will be provided by Celtic Clan and Sunday’s Well, two Irish acts that have been performing at the Black Rose for more than a quarter century. (When it comes to nightlife longevity, that’s like an eternity). Cunningham, who hails from Cork, has played at the Black Rose thousands of times since 1990. His most requested song is “Whiskey in the Jar,” a popular singalong that always gets the audience going. The Black Rose has been open since 1976. Here are some highlights from its 40-year history. Read: An Irish restaurant without chips? One chef’s culinary rebellion. The vibrant pub at 160 State St., which sits on a corner across the street from the Custom House Tower, stands out from the bleak, stone-gray landscape of Boston’s financial district. The facade is a friendly shade of green and the front doors are painted bright red. 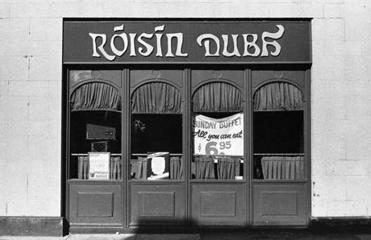 Black signs proudly display the pub’s name in gold letters in both English and Gaelic (Róisín Dubh). It’s like stumbling onto a little slice of the Emerald Isle amid the bustling city. Open the red front door, and you’ll walk into an Irish pub that’s bright and clean. Customers are seated at tables, eating fish and chips and sipping pints of beer. Bartenders, dressed in crisp white collared shirts and neckties, chat with customers while they mix and pour drinks. The ceilings soar high above the tiled floor, but the quaintly decorated walls provide comfort. The dark wood interior feels cozy. Colorful flags — each for a different county of Ireland — hang high from the rafters. On display is a copy of the 1916 proclamation declaring Ireland’s independence from British rule, and behind the dark wooden bar are the faces of seven Irishmen who signed the proclamation; they were later executed by the British government. Upstairs, there’s a second stage, fireplace, and another bar. Advertisements for Guinness adorn the walls, as well as a framed photograph of the Dublin Writers Museum. During the day, sunlights pours through the large windows facing the street. At night, the place fills up with convivial spirits and the jubilant sounds of the fiddle and penny whistle. Kate Kim and Peter Lynch outside The Black Rose on a recent March evening. 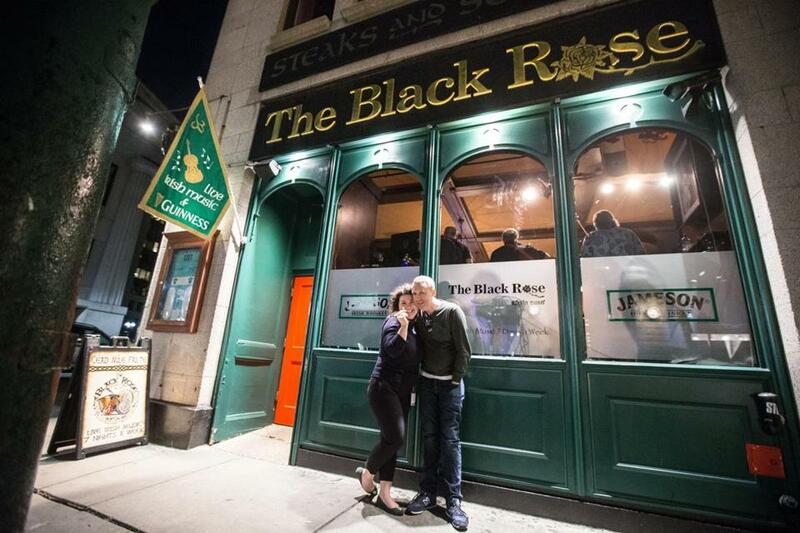 The Black Rose has been a hub for Irish music and culture from the very beginning, ever since Phil “Mother” Sweeney and Richard McHugh opened the place in 1976, when the restoration of Quincy Market was still underway. Wilson said many construction workers and laborers on that project found their way into the welcoming Irish pub. The exterior of the Black Rose in 1986. There’s been live entertainment seven nights a week since the very beginning. Christmas Eve has been one of the few exceptions, as was Sept. 11, 2001 (in the wake of the terrorist attacks, Wilson said it didn’t seem right to be playing music). “We’ve never closed for a snowstorm,” said Wilson. Not even a blackout could stop the melodies. One evening in August 1984, the power went out for a couple minutes, and Eugene Byrne and his band played through the darkness. While prices have gone up (an Irish coffee that cost $2.75 in 1985 is now $9) the menu itself hasn’t changed much: Shepherd’s pie, fresh seafood, Guinness stew, and daily lobster specials are staples. 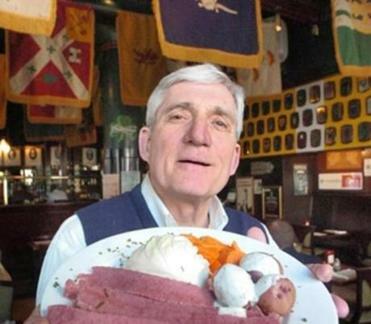 Sweeney passed away in 2014, but his memory lives on: Mother Sweeney’s corned beef is still on the menu, and the clam chowder is his recipe. Many politicians and celebrities have made their way into Black Rose over the years: The Dropkick Murphys and Black 47 have performed there; actors Sean Patrick Flanery and Norman Reedus have stopped by. John Denver once visited in 1997, and gave an impromptu performance, after sipping a few pints. Frank Ryan has been playing music at the Black Rose since 1984, and was there when Denver dropped by. He said it was an amazing coincidence: someone had just requested “Take Me Home, Country Roads,” and Ryan was shocked to see the songwriter himself sitting at the bar. Denver ended up singing that song, among others. “He was so gracious,” said Ryan. On St. Patrick’s Day, Ryan will play the guitar and penny whistle upstairs with his band Celtic Clan. Those who attend can expect to hear singalongs and classic tunes like “The Wild Rover,” “The Black Velvet Band,” and “Dirty Old Town.” As years have passed, Ryan said, “we’ve had to kick it up a bit,” so now they mix in contemporary music like “Galway Girl,” and songs from U2 and Dropkick Murphys. The Black Rose has never lost its charm, according to Ryan. Renovations have been made through the years, but the updates and improvements have been subtle. It still draws a diverse crowd (“it’s like the United Nations,” he says), and loyal patrons from the early days now bring their children and grandkids, he said. “The Black Rose is the Fenway Park of Irish pubs,” said Ryan. “Not everyone has been there, but everyone’s heard of it. “We get so many people from all over the world,” he said. Quinlin says the Black Rose is a local institution that’s comparable to Cheers or Charlie’s Sandwich Shoppe. 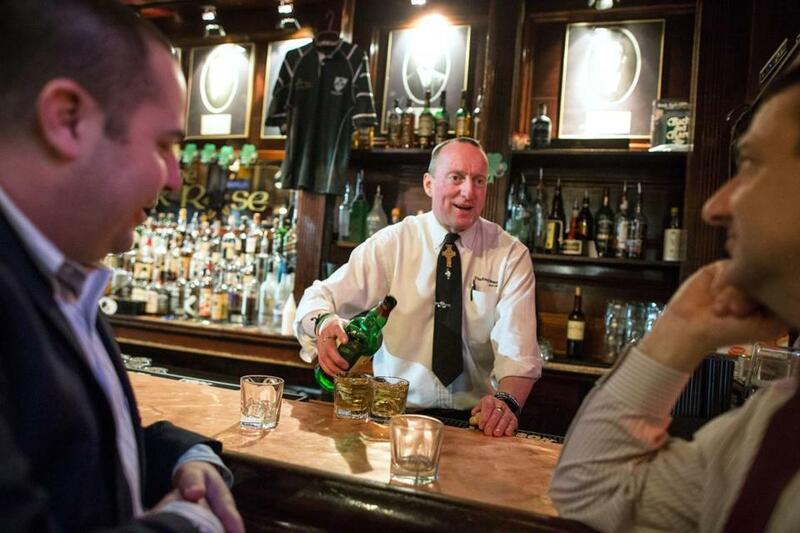 Senior bartender Kevin Fagan has been pouring at the Black Rose since 1994. On Thursday, the Black Rose will open at 8 a.m., and Irish breakfast will be served. The first 100 customers will receive a personalized Guinness pint glass. Music will be provided by Adam 12 of RadioBDC, Christian McNeill and Friends, Sunday’s Well, and Celtic Clan. For more information, visit www.blackroseboston.com .